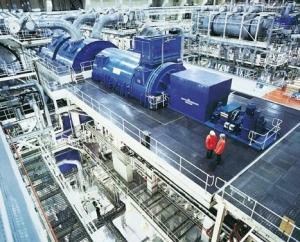 Looking for ways to reduce your costs and increase your output? Does delivering your products and service to your customers better, faster, and less expensive interest you? Would delivering a quality product or service in less time than your competition increase your sales? Do you want to be your customer’s preferred supplier? If YES, you should consider implementing a time based improvement strategy…. Time based competition is an operational strategy focusing on reducing total throughput time in an organization. 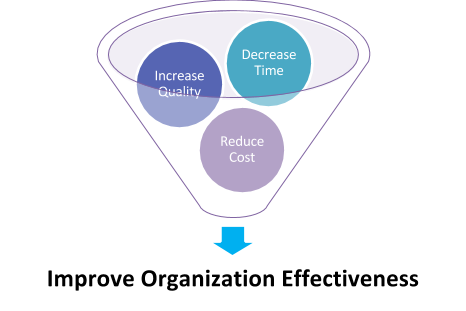 Eliminating time has an exponential effect on quality and cost. As time is reduced, productivity and profitability increase. We have found in our work that a thirty percent reduction in cycle time often results in a cost reduction of between thirty and forty percent. As productivity increases, resource capacity is increased. Two things happen: costs decline, and the organization becomes capable of producing significantly more output with less resources: a winning combination. Also, as time is reduced, quality issues become visible and variances are eliminated. Most manufacturing companies spend anywhere from five and thirty percent of total time actually adding value to the product. The rest of the time is waste. Our cycle time methodology focuses on reducing waste. Eliminating time in any process has a profound effect on time and cost. The need for non-value adding activities and support processes disappear. Overheads are dramatically reduced. Cycle time is the time required to complete a given process. The cycle time required to process a customer order might start with the customer phone call and end with the order being shipped. This may take twenty minutes in some organizations and thirty-six months in others. The overall process is made up of many sub-processes such as order entry, design, engineering, procurement, assembly, inspection, packaging, shipping and invoicing. The total cycle time of all of the sub-processes in your operation determines when you can promise product to your customer. Organizations generally have several primary processes in place supported by hundreds of smaller non-operational processes. The most significant process for any organization is its order fulfilment process. Order fulfillment is the complete process from point of sales entry or inquiry to final delivery of a product or service to the customer. 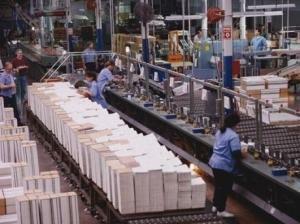 The order fulfillment process is the real value stream of the organization. This is where cost, quality and time need to be managed to ensure the product or service delivered meets the requirements and the expectations of the customer. Often, hundreds of smaller supporting processes such as the recruitment process or the supplier evaluation process can impact on the effectiveness of the order fulfillment process. What is Cycle Time Reduction? Cycle Time Reduction is identifying and implementing more efficient and effective ways to do things. Reducing cycle time requires eliminating or reducing non-value-added tasks and activities, which do not provide any real value to the customer. Reducing cycle time has a significant impact on a company’s profitability and ultimately customer satisfaction when implemented. What are the Benefits of Cycle Time Reduction? WP1 works with you and your team to understand your business and its processes. Since 1990, we have been helping organizations improve using our Cycle Time Reduction Methodology. Together, working with your employees, our methodology comprises four steps. In order to fully understand inputs, processes and outputs that you are responsible to deliver, we document the existing way you do business. A series of interviews takes place with employees where information is collected and mapped. If required, interviews are sometimes scheduled with customers, suppliers or other stakeholders. Mapping process flow is a fundamental step in reducing total cycle times. Mapping the flow and tracking time for each of the events provides a basis for analysis. A process is any series or combination of tasks or activities which produce a result. The result could be a machined part, a telephone call to a perspective client, a drawing, or a requisition for materials. The cycle time is the time from the beginning of the first step of the process until the beginning of the first step of the next process. Processes can be decomposed into smaller tasks or activities. Traditionally those activities are performed in a sequential manner. In this situation each step is completed before the next one begins. Once cycles are mapped, the opportunities to compress time can be pursued. The goal in compressing time is not to devise the best way to perform a task, but rather to either eliminate the task altogether or perform it parallel with other tasks so that the overall system response time is reduced. Process mapping can reveal the constraints and bottlenecks in an operation. This identification can facilitate the streamlining of processes, increasing both productivity and throughput. We suggest initially identifying and mapping the entire order fulfillment processes to discover the bottlenecks that affect total throughput time, and re-engineering those first. Bottlenecks will shift from one operation to the next as each one is resolved. This is an application of basic constraint theory, and will get results that have greater impact on the company. Interviews with the Senior Management Team are conducted to collect the information required to complete the top level process map. Each of the process steps depicted in the top level process map will then be expanded with the employees responsible for the process and those charged with the responsibility of performing the work. This next level map will detail the work steps and the supporting procedures and forms used by the employees to accomplish the required output. WP1 will also document what controls are in place to ensure this level of activity is accomplished properly. Where there are no controls and there is a clear need, gaps will be recorded. Each of the foregoing steps will typically require at least three meetings with the employees responsible for the specific part of the process. The initial meeting will be to gather sufficient information to permit a draft map to be created. Typically, these meetings can take one to four hours. The second meeting will take place after the creation of a draft process map. Our consultants will then review the documented processes with the employees responsible for the work to gather additional input/corrections. In some cases, additional meetings will take place where the process is complex. A final interview/meeting will take place to obtain concurrence with the completed map. The outputs from this step will be a top level map and a fully connected process map of the process under review. WP1 meets with the management team to obtain concurrence with our initial analysis on a regular basis throughout the process. The Output from Step Two will be a complete set of recommendations suggesting improvements in the existing processes. 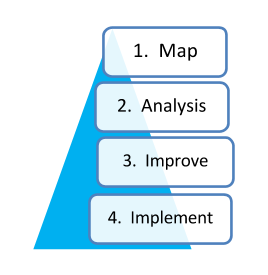 Once the recommendations for improvement in Step Two are accepted and approved by Management, a new detailed process map is prepared incorporating all of the improvements. The new process map serves as the foundation for the ongoing improvement project. As the new process map is developed, a meeting is held with the Senior Management Team to ensure complete agreement with the required changes. Organizations that have undertaken this approach to process improvement have found that it is possible to eliminate or improve the process steps permitting a double digit improvement in throughput. This has permitted these organizations to process much more work with the same or less resources. WP1 will provide a suggested employee communication plan. A new organizational structure to manage the new processes. Metrics that will permit measurement of the improvement. Typically, organizations fail at the implementation phase of the project. This is the most difficult part of any improvement process. This is where and when real change in the organization occurs. Managers and employees feel that there will be extra work for them as a result of the changes. Given the complexity of the implementation, many of our clients have found it valuable to engage us in working with them on a facilitative basis to ensure the implementation plan is successfully managed. Consulting firms regularly coin phrases to promote their company: Time Based Competition, World Class Manufacturing, Lean Manufacturing, Six Sigma etc. The essence of the new approaches quite often amount to nothing more than the flavour of the month. Just like anything else, time based competition or total cycle time reduction is no panacea, nor should it be embraced as a religion. It is an operational strategy and methodology that, if implemented properly, will provide a new dimension to competing: quickly introducing new high quality products and services that can be delivered to customers with unprecedented lead times, improved quality and a reduced price. Click here to get in touch and learn how Workplace One can help your business.